Lvgdvi (Lyons): Gvlielmvm Rovillevm, M.D. LXXXI (1581). Bible printing had come to France through Lyons, a cosmopolitan center of trade, introduced in 1472 by Guillaume le Roy. 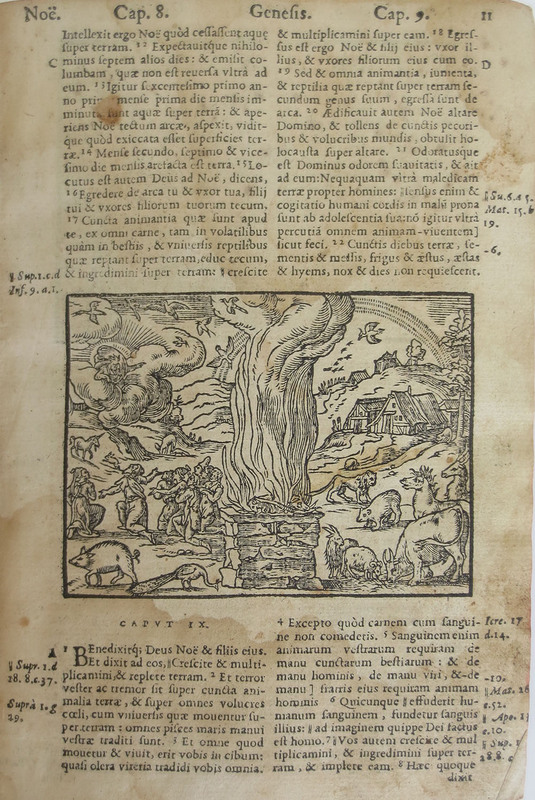 This Bible was printed by Guillaume Rouille at Lyons in 1581. Its small format illustrated with ornate woodcuts is typical of Lyons, which had previously been a major producer of playing cards decorated with woodcuts and drew heavily from Italian printing traditions. The woodcuts in this Bible were done by the eminent sixteenth-century artist, Pierre Eskrich, known as Le Petit Bernard.